Modest but Beautifully Crafted Retreat in Northern France. Orne is the most southern department in Normandy and has a population of just 300,000. Due to the positioning of hills in the area, the department is kept very green by regular rainfall. This has created an ideal environment for nature lovers to explore the deep forests and flowing rivers. The Orne valley is characterised by large dark rocks that are ideal for climbers. The highest peak reaches an impressive 1197 ft.
Alencon, the departmental capital was the first town to be liberated by French forces at the end of World War II. It is more widely known, however, for the lace that it produces. Just to the West you will see the hills that the locals have proudly named the Alpes Mancelles. Argentan is a small, charming town in the north of the department. It has two elegant, Gothic Cathedrals. The town makes a great base for exploring the two diverse areas on either side, the Suisse Normande in the west and the Foret de Gouffern in the East. The well looked after town of Bagnoles-de-L'Orne has the unique claim of being the only spa town in Normandy. 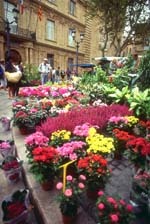 It feels like most spa towns you would find in France as it has a peaceful environment with pristine parks and lakes. It is located near to the Foret d'Ecouves and so is a great spot for walking and cycling. The most impressive piece of architecture in the department is to be found just southeast of Argentan where the enchanting Chateau d'O towers majestically over a lake. It was built at the time of the renaissance and looks like something from a fairytale. After exploring the building you can relax in the gardens or visit the stables. The nearest airports to the department with direct flights from the UK are at Dinard, Rennes or Paris. A second option is to get a ferry to Ouistreham (Caen), Cherbourg, St-Malo or Le Havre. The Channel Tunnel is also an option. You can either take your car or get the TGV train that will take you to Evreux, Le Havre or Caen. The region as a whole is becoming very popular with British buyers, especially as Brittany's market is filling up. There is a large range of value for money properties across the department, many requiring renovation. Do you know Orne better than we do? Do you have photos of Orne? Orne is situated in the south of Lower Normandy above Le Mans.